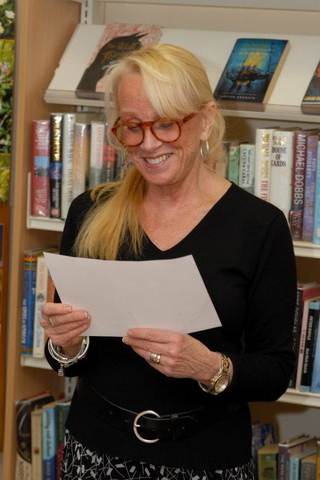 Poetry reading at Midleton Library, County Cork, Ireland, 2012. Photo by Fergus McCarthy. Patricia Traxler's award-winning fourth poetry collection takes its shape from her Pablo Neruda Award-winning sequence, "War: a Memoir," the eleven sections of which span the book and create a compelling narrative arc. The poems of Naming the Fires examine intimacy, faith and doubt, family, and the passage of time in a world riven by war, unrest, and violence, and driven by sexual, material, and spiritual craving, and a hunger for meaning. "The world has changed at a startling pace since I began publishing poems in my twenties," Traxler says, "and yet there has never been a time I can remember since earliest childhood when it was at peace. At some point I needed to settle in and think about what those years had really meant. I chose the quiet of the American prairie--birthplace of my father and his father--for my coming to terms with life and time, reflecting on our torn world and the fragility of belief in such a world, on trust and broken trust, love, pleasure, friendship, isolation, and loss, as well as a reckoning with my own mistakes, my serious missteps. I realize everyone has regrets to contend with, but that doesn't lessen the sense of gravity and sadness at one's own failings. These poems took me through all of that, in the process examining the desires, fears, and vulnerabilities that are inevitably part of being alive in our world." Naming the Fires is the winner of the 2019 Hefner Heitz Kansas Book Award in Poetry and was a nominee for the Paterson Poetry Prize and the Poetry Society of America's William Carlos Williams Award. "Patricia Traxler holds us in the devastating thrill of freefall, half-past naming and this close to combustion. Her skill at balancing the tempting fixity of nouns and the reckless commotion of verbs is no less heart-rending than a principal ballerina's sustained pirouette; she leaves us spinning. It would seem that few poets move so beautifully between short pulsating thoughts and longer narrative ideas. In Traxler's hands we bloom, float, row, thaw, wake, pray, and burn. Somehow more held than holding. What a gift to rest in such a poet's practiced embrace." “Forbidden Words is an outstanding and enviable performance."